Thou shalt never eat a burger, when the cheese has not fully melted. Thou shalt only eat a burger, cooked to a medium-rare. There is no such thing as a “veggie-burger”… I’m sorry. Now if you mean to order a faux-burger, it’s called a “veggie-sandwhich-on-a-hamburger-bun”. Just because you put a bazillion toppings on a burger, does not make it good. There is no such thing as a cheese-burger, for a real burger always has cheese. Whilst devouring thou burger, only water shall be drank, for it cleanses the palette while devoid of contact with peasant flavors. The fries are important to the burger. Just as Robin is important to Batman. Burger joints with the name “Burger” in the title, will prove to be mediocre. A burgers’ most important facet, is the quality of beef used in the patty. 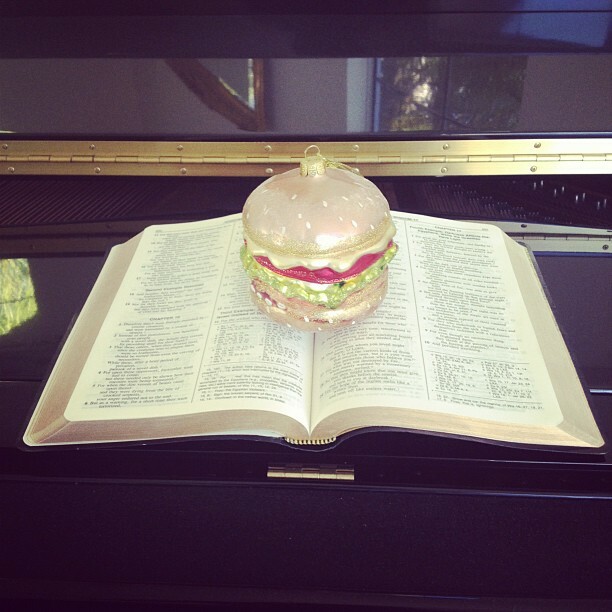 Thou shall always use two-hands whilst deflowering thou burger. Thou shalt leave no fry behind. People can eat whatever they want… As long as it’s a burger. by the 4th dimension of time. And this, is the word of Dan — Praise be to Burger!